Thank you Coach Henninger for speaking to juniors at the Indiana Crossroads Conference Symposium about leadership and legacy. On Palm Sunday, we place most of our focus on the reading of the Passion at Mass (and rightly so). However, there is another Gospel reading at the beginning of the Procession or Entrance that struck me in a new way this week. This year we read from Luke 19:28-40 about Jesus' entrance into Jerusalem. Before His entrance into the city, Jesus sent two disciples to retrieve a colt (a donkey) tethered in a neighboring village. If anyone gives them trouble, they are instructed to say, "The Master has need of it." When they are untying the colt, the owner of the colt asks them why they are untying it. Apparently the answer "The Master has need of it," was enough to satisfy them, because no further questions were asked! "The Master has need of it." Well, the Master also has need of us. He has created us out of love and given us a purpose in His plan of salvation in the world. He desires that we be united to Him perfectly in the Sacraments he has given us, and that through His Church we may one day be with Him for eternity. The Master has need of us. This need, this Love is greater than any desire or love that we can imagine. Knowing that He has need of us, that He desires us to draw close to Him, let us enter into these holiest days of the year with open hearts. We often share with the Lord what we need from Him. Perhaps during this year's celebration of the Passion, Death, and Resurrection of Christ, we can ask what He needs from us. 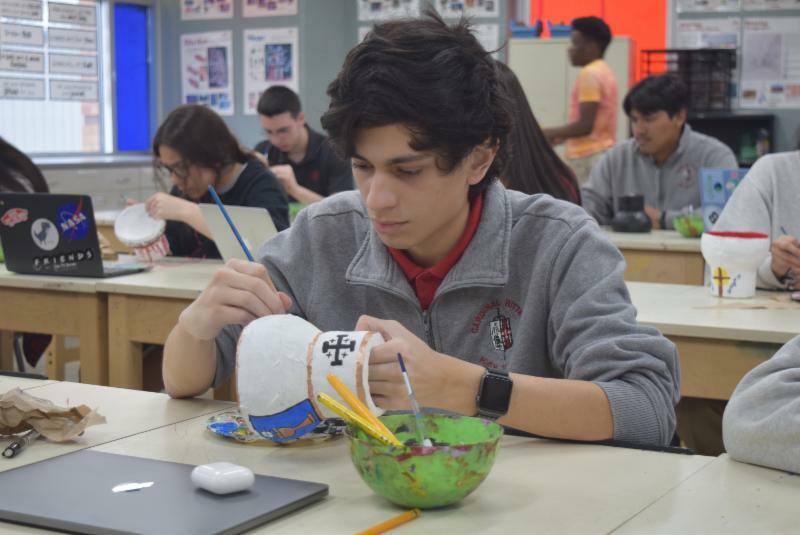 Cardinal Ritter art students are in the process of painting over 150 bowls they sculpted for the Simple Soup & Bread Luncheon on Thursday, April 18 benefiting the Crisis Office of Catholic Charities. We are so proud to see CRHS students espouse our Franciscan Values! Learn more here . 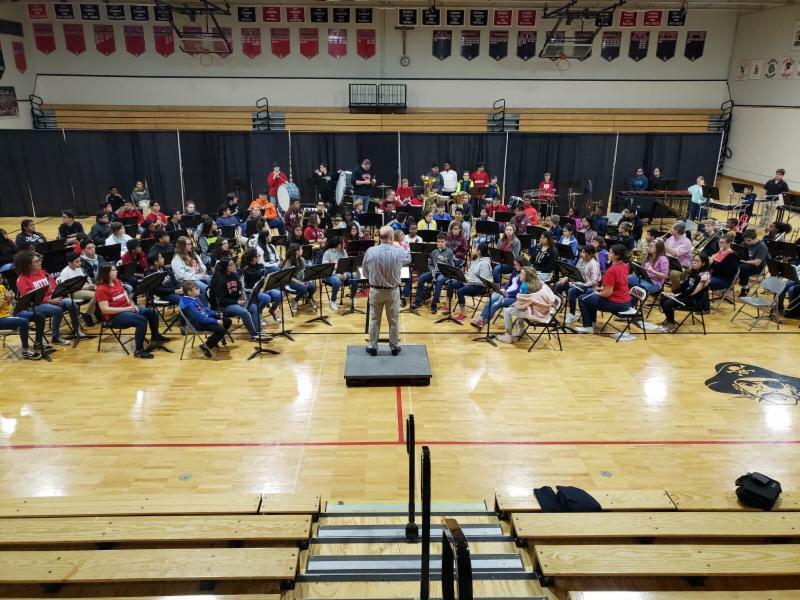 Thank you to all students who participated in our second annual West Deanery Band Festival. Thank you Ms. Castillo for this shot from the junior boys' retreat yesterday. We want to thank Fr. 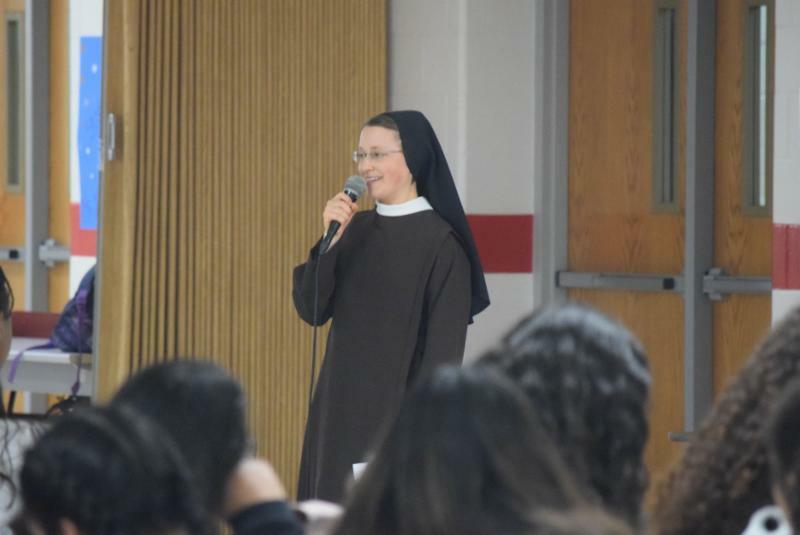 Anthony Hollowell, Associate Pastor of Our Lady of Greenwood, and Sister Maria Faustina of the Sisters of Saint Francis of Perpetual Adoration for speaking to Cardinal Ritter young men and women about virtue and vocation this week. 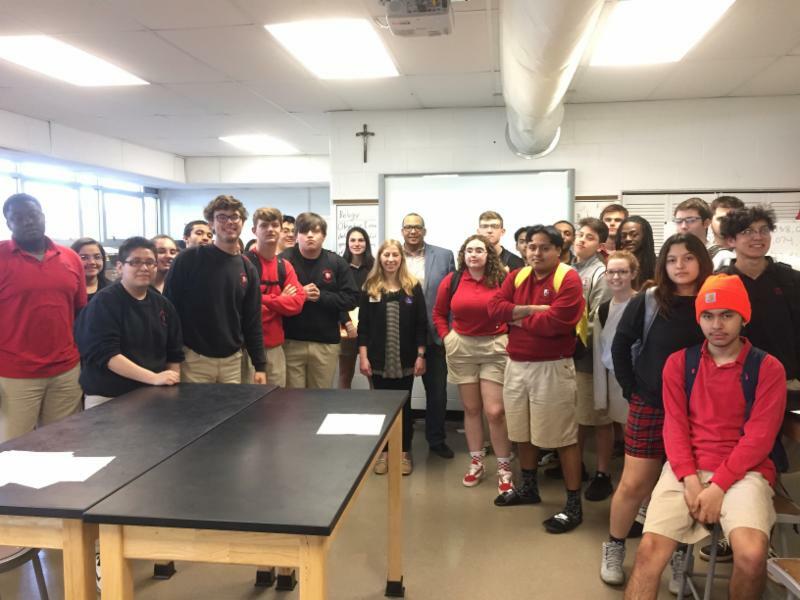 Kacie Hoover and Marc Dahmer, meteorologists from the National Weather Service, spoke with Mrs Sperry’s Ecology class yesterday. They discussed what to do in the event of severe weather, how to identify signs of potential severe weather, and how to interpret data on a map taken from weather balloons. Be sure to follow the CRHS cafeteria's new Twitter account (@CafeteriaCRHS) for weekly lunch menus and new items being added to the lunch room. Support the Junior Class at Applebee's! Bring in or show this flyer and a portion of your bill be donated to the Junior Class. Runathon packets were distributed to our student body today. This is our biggest student-driven fundraiser and our goal is to have 100% participation! Sponsorship opportunities are available, as well. Please contact Katie Waggoner for more information. To donate online, click here . Sign your student's permission slip here . Cardinal Ritter flower sale pick-up will take place on Friday, May 3. We need plenty of volunteers to help with this fundraiser. If you are able, please select a volunteer position and time that works best for you here . If you have questions, please contact Christy McDaniel . Parents, now is your opportunity to purchase an advertisement in the 2018-19 Cardinal Ritter Yearbook. Purchase an eighth of a page for $30, a quarter of a page for $40, half page for $50, and a full page for $70. Click here for more information. Please reach out to Emily Fox with any questions. Thanks to all who ordered flowers. Items will be available for pick up on Friday, May 3rd from noon - 5 p.m. We will have additional flats, hanging baskets and planters available for purchase. Please contact Marie Schelonka with any questions. Want to earn service hours? Please join us on Friday, May 3 for Runathon. We look forward to a fun and dynamic event and the opportunity to serve students. Sign up to volunteer here . Please contact Kim Diaz with any questions. Attention Hendricks County Freshmen: Consider applying for this leadership opportunity! Applications for the Youth Leadership Hendricks County (YLHC) 2019-20 class are now available, and due to your school counselor by April 17th. Current freshmen who live in or attend high school in Hendricks County are eligible to apply. 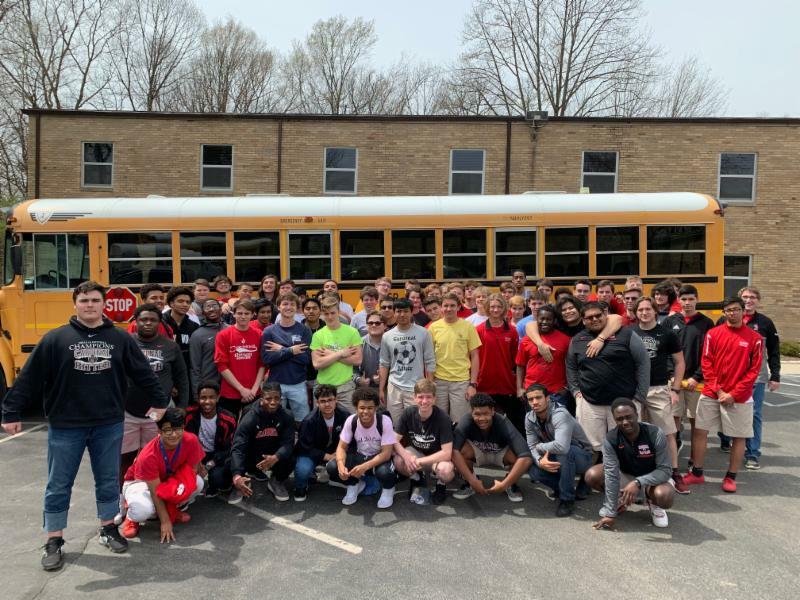 Through a weekend-long opening retreat and six full class days in our community, YLHC helps students become more confident leaders while learning about our area and its leaders. 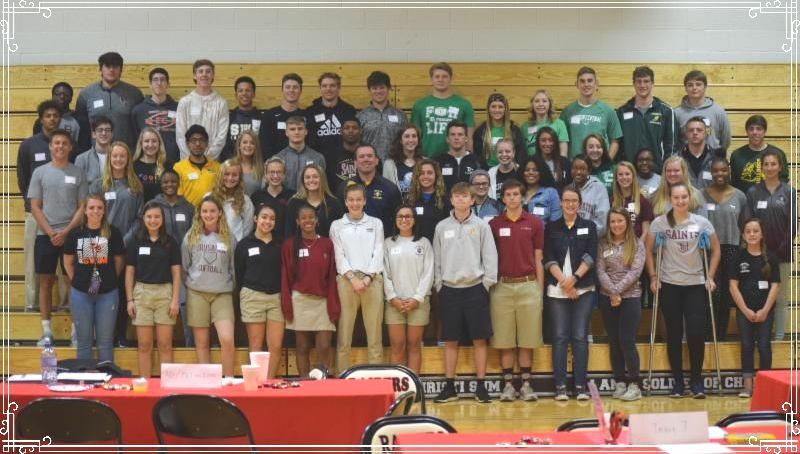 The program has been developed to introduce and enhance student leadership and communication, provide career development opportunities, and teach various components of Hendricks County through experiences, activities, speakers, and community service. Follow this link for an application and submit to your counselor by April 17, 2019. Most students taking Biology this year will be taking an online assessment this spring called ILEARN Biology. Most students will be testing during Biology class and will be between April 30 - May 9. If you have any questions regarding your student's assessments and requirements, please contact the Guidance Office at (317) 924-4333 ext. 420. Mr. Jeff VanMeter is bringing a Driver's Education course to Cardinal Ritter High School this summer. 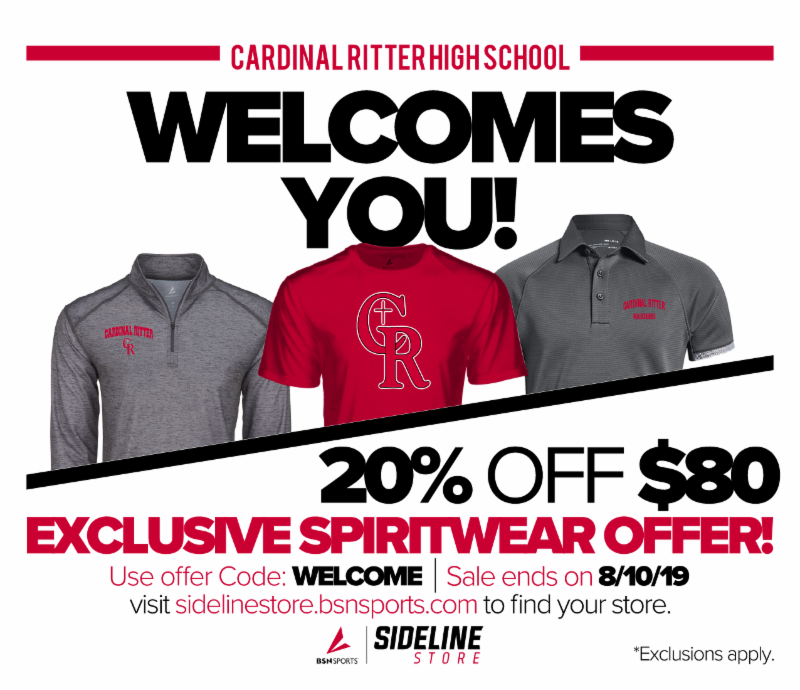 Use the promotion code WELCOME to receive 20% off any online spirit wear order over $80 through August 10, 2019. Our Campus Ministry team wants to pray for you! If you or someone you know is in need of prayers, submit a prayer request and every other week the Campus Ministry team will be praying for the needs of our community. Click here to submit a prayer request. 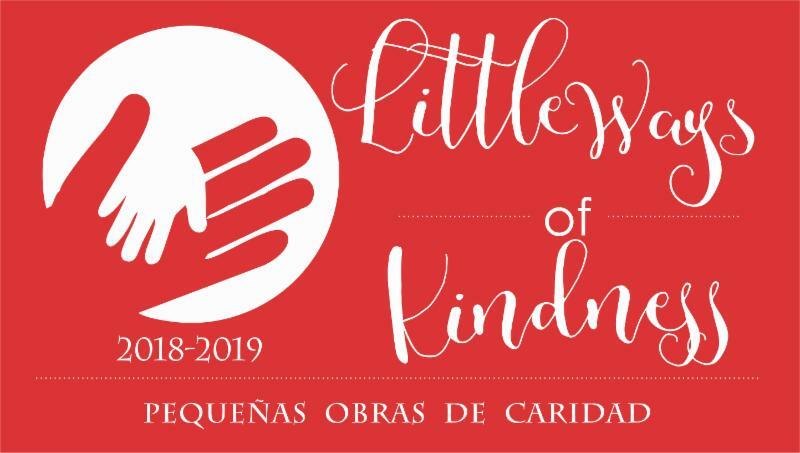 Don't forget to select Cardinal Ritter High School as your charity of choice at smile.amazon.com and a portion of your sale will be donated to CRHS! Earn rewards for CRHS every time you shop at Kroger! Support CRHS every time you shop at Kroger! Log in to your Kroger account and click " My Account" at the top of the homepage to get to your Account Summary page. Click the "Add Card " button under " Plus Card and Alt ID(s)." Type your 12- or 13-digit Kroger card number into the " Plus Card -or-Alt ID Number" field. This number is at the back of your Kroger Plus card . Then you can click on community rewards on the side bar and type Cardinal Ritter High School into the search space. 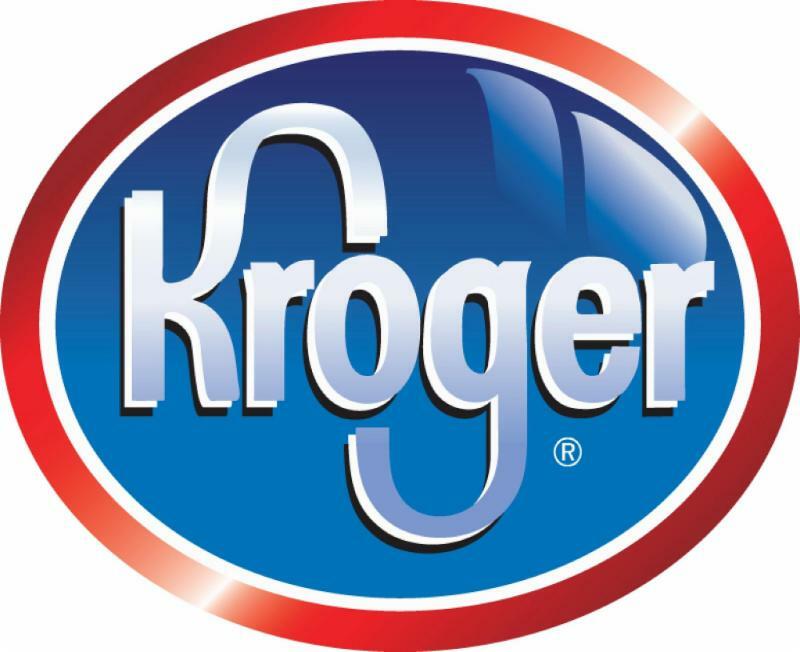 CRHS will earn money every time you swipe your Kroger Card. Lady Raiders: Saint Mary's College is offering a summer Institute on their campus this summer called Embody. Embody will take place July 7-12 and July 14-19. You will have the opportunity to preview college life and meet other awesome girls! Visit saintmarys.edu/Embody to learn more about this program and to apply. The cost is $300 for the week. You must apply by April 15th. Check out the different programs offered by the Center for Leadership Development (CLD). If your student participates in many of these programs, they can be eligible to earn college scholarships! Junior high students can participate too! Students entering grades 9-12 may attend. The cost is $229 for each one week workshop. Indiana Black Expo, Inc. is committed to assisting Indiana students in their pursuit of higher education. Scholarships will be awarded to current high school seniors and students currently enrolled in a post-secondary institution who exhibit outstanding leadership, scholarship, and community service. Emphasis will be placed on financial need and first generation students. Each applicant will be evaluated based on the application information provided and recipients will be selected by a review committee. The scholarships are funded by proceeds from the Circle City Classic® Football Game and are payable upon recipient's full-time enrollment in a post-secondary institution. More than $4.6 million has been awarded to students since 1984. This year the application deadline is April 15, 2019. Here is the link to the online application. University of Dayton Engineering, Entrepreneurship, and Leadership Camps! Scholarship and standard applications have just opened up for Camp Cardiac & Camp Neuro Indianapolis 2019! Students may learn more and apply by visiting http://www.campcardiac.org and http://www.campneuro.org . There's a huge shortage of cybersecurity experts in the US. Girls Go CyberStart encourages high school girls to explore the exciting career opportunities in the field, join the global cybersecurity community and learn skills that will ensure our country offers a safe place to live, work and play online. Learn more here . At Duke Summer Session , we are determined to transform you into one who envisions, shapes, and delivers the incredible possibilities of tomorrow. Learn more here . Schola offers a unique opportunity to rising high school sophomores, juniors,and seniors to spend an elevating and revitalizing week engaged in a rich schedule of academic, cultural, and recreational activities centered on lively seminars discussing several of the great books of the Western world. Click here for more information. Many colleges and universities offer free Diversity Fly-In Programs in the fall semester to top underrepresented, first generation, and/or diverse students. Attending one of these programs can demonstrate strong interest in an institution and potentially help one’s chances of being admitted. For more information about these upcoming opportunities, please follow this link . This one-week, exciting Summit is designed exclusively for high-achieving high school students and will be held on the campus of George Mason University, just outside Washington, D.C., from June 23 to 28, 2019. You can learn more about this opportunity by clicking here . Through our summer scholars program, students may choose from 22 courses in a variety of fields, perfect for sophomores and juniors who want to explore their passions and interests while earning college credit. The John Carroll University Young Writers Workshop, a week-long summer camp at John Carroll University, is now offering both day camp and overnight residential options, so students from all over the country can experience inspiring and rigorous creative writing! This year's workshop takes place from July 22-26th, 2019. The cost for the day-only option is $380; the residential option is $980, though there is an early-bird rate in April. The application deadline for the workshop is June 1st, 2019. For more information about the JCU YWW, please visit sites.jcu.edu/yww . 1. 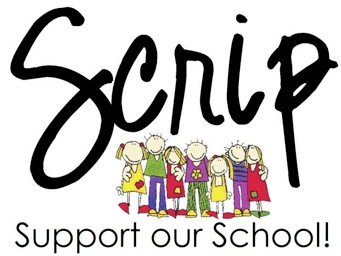 Go to shopwithscrip.com and create an account. Our organization code is FE97AB26258L. 3. After your order is complete, choose your payment method - either check or PrestoPay. You DO NOT have to use PrestoPay to order online. If you choose check, just send your payment in with your student on Monday morning. 4. Look for your order to come home on Wednesday or Thursday-unless you ordered ScripNow (e-certificates) or Reloads. Those will be available as soon as the order is processed on Monday if you pay by check, or almost immediately if you pay with PrestoPay. 5. Click here for more detailed instructions. 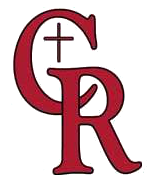 Cardinal Ritter is a Catholic high school entrusted by the Archdiocese of Indianapolis and the parishes of the West Deanery to provide, within a college preparatory curriculum, the highest standards of academic excellence to students of diverse socioeconomic, racial, and religious backgrounds. 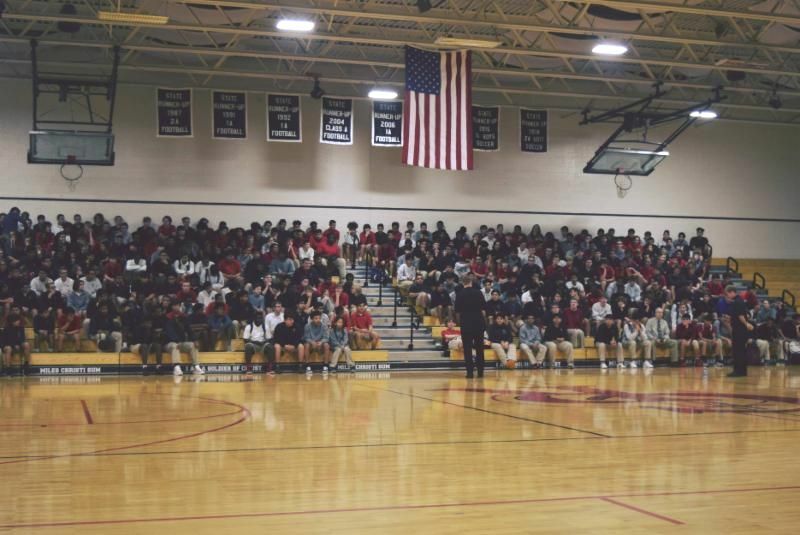 Cardinal Ritter challenges its students to grow spiritually, intellectually, athletically, and artistically. The Cardinal Ritter community values and fosters the unique intellectual, cultural, social, and physical gifts of each student. As followers of Christ, we encourage our students to share their gifts and talents in service to others.